7.1 Communicating with Families: Teacher communicates with families about students’ progress on a regular basis, respecting cultural norms, and is available as needed to respond to family concerns. For me, communicating with families begins with inviting and culturally respectful contact but doesn’t end there. Communicating with families also means following through on concerns and questions that arise out of that initial contact. One technique for fostering excellent communication with families is the positive phone call home at the beginning of the year. This positive phone call lets families know that you are available and approachable, gives clear information about how to contact you, and invites open communication about concerns and questions. In addition, by establishing a precedence of “good news,” you make future phone calls home easier and more productive, even if they may arise in response to problems in the classroom. We have 65 students in two periods and I either spoke with or left a voice message for 57 parents or guardians total; the other eight had unlisted or inactive phone service. I kept track of the phone calls on each students’ information card, simply noting the date and an “M” if I left a message rather than had direct contact. This practice serves as a record of my contact with families. 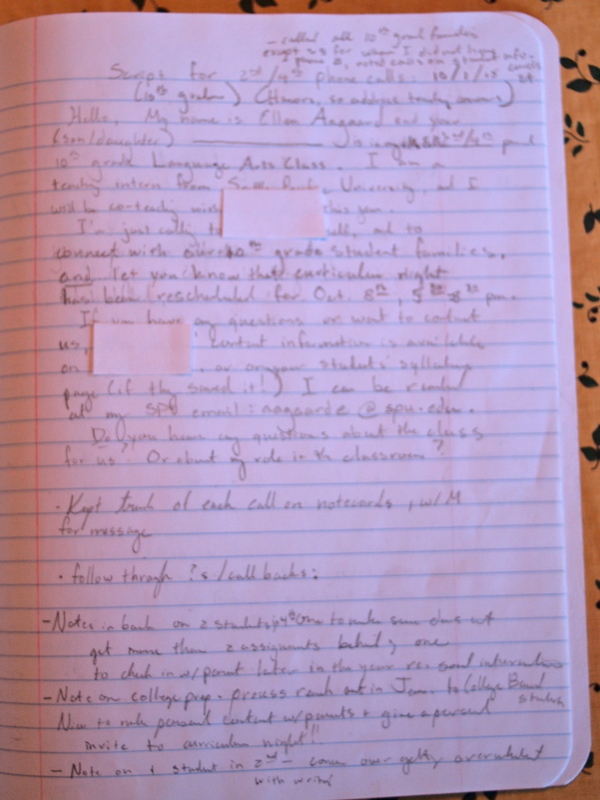 At the bottom of the Script for initial phone calls home image you can see the most important notes I take during such phone calls: specific information shared by parents or guardians that will help me in serving my students. In order to remember and respond to this information, I also record it in a different section of my teaching logbook, organized by period, which I review weekly and to which I add notes on observations and informal assessments of individual student progress in targeted areas. This allows me to address the second and, for me, most important aspect of communicating with student families: following through on concerns and questions. 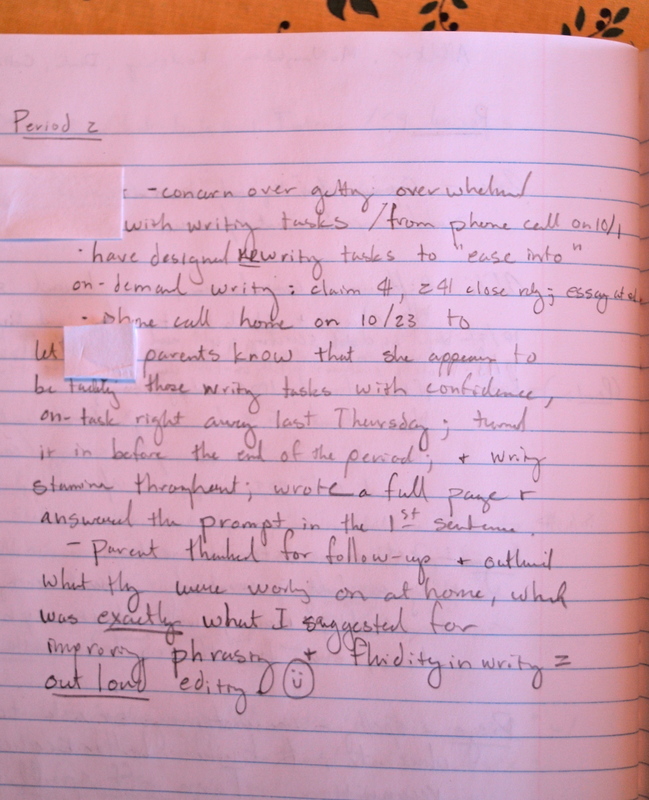 In this example, you can see that I referred to the purpose of those writing tasks and to specific observations made about the student’s ability to handle the first task. I noted that the student appeared confident while writing, was immediately on-task, turned her writing in before the end of the period, and wrote a full page responding to the prompt. I intentionally made this phone call before grading the assignment because I wanted the focus of our communication to be on the students’ writing confidence and habits, rather than an evaluation of the finished product. You can also see, at the end of my phone call notes, that the parent and I discussed a way to foster a “next step” in writing fluidity: out loud editing. I am pleased to report that the student is receiving help at home in editing her writing out loud, and that when I read her in-class paragraph I noted several edits to her text that corrected awkward or grammatically incorrect sentences. This information indicates that my communication and follow-through with families resulted in the student’s progress as a writer and editor. One thing I would like to improve about my parent communication at the beginning of the year is finding a way to continue positive outreach to every family throughout the year. While it is both manageable and worthwhile to continue phone communication with a few families who have requested targeted observation and support, individual phone calls to 60 parents takes about three hours; for all 140 students it would take over five hours. When I have my own classroom, I plan on asking parents if they would like to receive regular email updates on our classroom and building a parent/guardian email list for each class. I would send an email to families at the beginning of each unit. That email would outline essential questions and objectives for the unit as a whole. I would also attach a link, if available, to an article or short story the students are reading in class, in order to spark shared literacy and conversation at home. This entry was posted in 7.1 and tagged communicating with families, following through with concerns on October 24, 2015 by aagaarde.